We all spend plenty of time in our laundry room and the principles of feng shui can be used to create an organized, pleasing space. As an area that harnesses the water element and removes dirt and debris, the feng shui principles are similar to the bathroom. The laundry room is a space of purification by removing soil and renewal with clean fabrics. A bit of attention will increase the flow of positive chi in your home and make laundry time more pleasant. If you are building a new home or remodeling, laundry room placement following the principles of feng shui can optimize and enhance your wealth sector. The laundry room should not be placed in the wealth area of your home since a wealth sector is governed by wood. But as a place of water, the laundry room nurtures wood. Do not place the laundry room in a fire area of the home since fire and water work against each other. 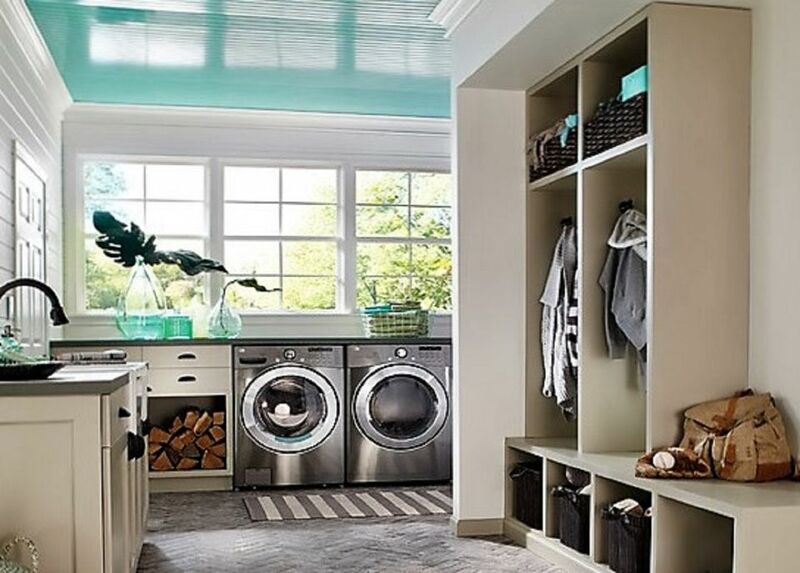 A great deal of time is spent in your laundry room. It should be as inviting and pleasing to the eye as your bathroom to enhance and attract wealth. Take time to look around the laundry area and reflect upon how it looks. Does it look neglected? Is it dark? Are the colors disturbing? Take a look at the five best paint colors for your laundry room. To improve or enhance your finances, a feng shui laundry room should be light. Light hues of blue or green are enhancing colors that attract water. Wood choices for cabinets and trim should be tan or light brown. Keep everything light. One of the most important elements for the laundry room is good lighting, whether through windows or overhead lights. Good lighting creates a positive flow of chi and allows you to see what you are doing. Adequate storage should be included for the laundry supplies that are needed. It should not, however, become a catch-all room for storing unrelated items. There should be enough counter or work table space for folding clothes. Do not use this space for storage. It should be kept clear when not in use. Do not place a dragon facing the laundry room. Dirty water is flowing out of the room and the shar chi (negative energy) can impact the energy your dragon enhances. A bowl of multi-colored blue and light brown crystals or colored stones can enhance and attract wealth. Don't overdo your design with too many feng shui elements. Keep the laundry room uncluttered. Even if you can't remodel your laundry room or build a new one, there are some basic rules governing the feng shui of a laundry room that can be incorporated at anytime to create harmony. Check around and underneath your washing machine to be sure to no hoses or other parts have leaks. If you have leaks, repair or replace your machine. Slow leakage reflects in your finances. The lid or door of your washing machine should be closed at all times. Just like the toilet in the bathroom, clean water is flowing into the room while dirty water is flowing out of the room and your home. An open lid or door will let your finances flow away from you with the dirty water. Keep the dryer door closed, as well. The door leading into your laundry room should be closed at all times. If you don't have a door, hang a curtain or beads around the area. Remember to keep the colors light. Cleanliness and organization are feng shui principles that are so important in the usually small laundry room space. Remove the dryer lint regularly. Lint is clutter and holds onto shar chi. It also creates a real fire hazard. Throw away old detergent containers and empty the trash can regularly. Use baskets or hampers to sort clothes waiting to be washed. Do not leave laundry lying on the floor. Fold or hang up clothes and put them away immediately. Don’t allow clothes to accumulate in the laundry room. Replace burned out light bulbs right away. Clean floors and sinks regularly.